When the Romans arrived in Britain in 43AD., they took over a country that was disorganised, fragmented, and divided into sections, each occupied by a different race of people. There was no central administrative centre, no road network, no law or order. There wasn't even a single currency in use throughout the land. It was clear that there had to be a massive rebuilding programme from the roots up. Not just in building terms, but also in educating the natives to accept a new way of life. As the Romans moved further inland, they built effective roads, grand and impressive buildings and established strategic centres, both civil and military in the form of the Roman town. Within 17 years of the invasion, they had several major towns in place. connected by the famous Roman roads. The three largest we now know as London, Colchester and St. Albans. Even though towns where built across the country, they all had several factors in common both physical and structural. There was one thing that is noticeable in many towns. The Romans were no respecters of the homes of the natives. Towns such as Canterbury, Chichester, Silchester and St. Albans were found by archaeologists to have been built over the foundations of Celtic settlements. Whether the occupants went voluntarily and had alternative homes is unclear. Either way, the Romans demolished their homes and built their own constructions in place of the native dwellings. Most of the smaller towns were not really meant to have been built, they sort of happened over a period of time due to trading needs. Chichester, Dorchester, Cirencester, Exeter and Wroxeter were never meant to have developed to the scale they did. The reason for their establishment was simple. 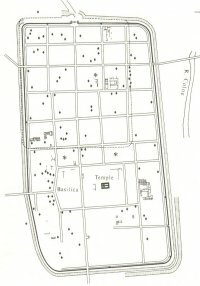 These locations all had a Roman fort holding about 500 soldiers. There was nothing for them to do in the vicinity, so gradually traders set up close to the fort and before long the basis of a town had been established. First came the shops and taverns, then as the town grew, more and more houses were built to accommodate the owners and staff of the shops. Cirencester developed first by the construction of the fort, then the town gradually expanded North-West. Anything the Romans built had a structure and order about it, along with a specific purpose and reason behind the method. 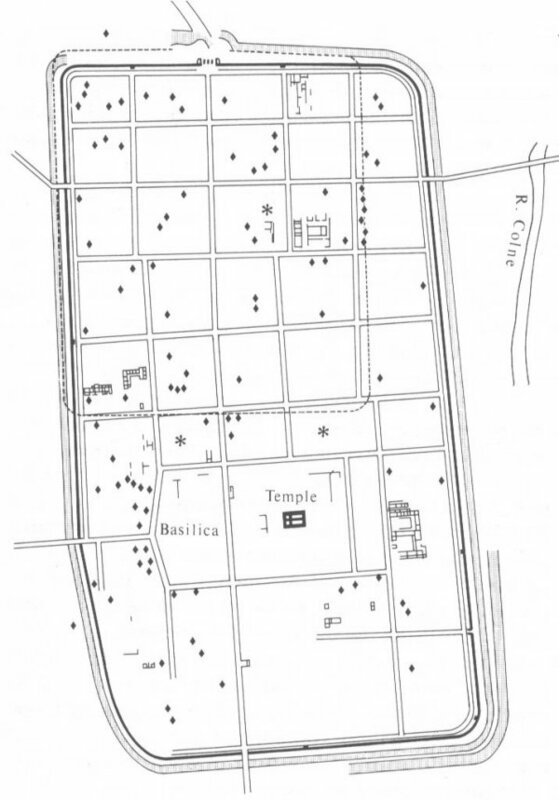 Although there are some variations, this is the general layout of a Roman town. The town would have two main roads. One heading North-South and the other East-West. The directions were not always spot on, they may have been several degrees either way. But the general direction was constant. At the point where these roads met was the town centre and it was here that the administrative centre, the forum and the market could be found. From here the town would radiate outwards with new roads being built as needed. The roads would be at right angles to each other and parallel with one of the two main roads. In the central portion of the town would be the main businesses, with the homes and dwellings of the citizens further towards the edges of the town. Even in Roman times, traffic congestion was a major problem with merchants arriving with goods for the shops, travellers passing through, service workers moving to their next appointment and pedestrians going about their business. In the larger towns this congestion was so bad that the council had to place traffic controllers at main junctions. This was normally a Roman soldier who had been seconded to civil duties. Depending on their use and importance to the community, the roads were between 16 to 26ft (5m to 8m) wide and constructed with a surface of gravel which was cambered to allow for rainwater drainage. Due to the heavy use, the roads needed to be repaired regularly and they were completely relaid every 25 years. The constant resurfacing work meant that the road surface increased in height over the years, and many roadside shops eventually had entrances below road level. At the heart of the town were the two most important buildings. The Basilica and the Forum, both of which stood and the main crossroads. The basilica was a great hall with offices and chambers to the rear. The hall, about 30ft (9m) was divided by two rows of columns into a nave and two aisles. The Basilica was the town hall and local court where minor cases and disputes were settled. Jail was unknown in Roman Britain, since the Romans believed that locking someone away would deprive the community of a worker. The remainder of the building was taken by offices dealing with local government affairs. Shopping malls are not as new as may be assumed. They existed in Roman times in the larger towns as vast halls filled with shops leased from the local council. Judging from remains excavated, each hall was designed to be filled with shops selling one type of produce. This ensured competition and value for the customer. One hall would contain meat products, another fruit and vegetables, another clothing, and so on. Most of the buildings in the town were made from timber, this being the easiest material to use and made the construction process a lot faster. The wood was obtained by felling local forests and reusing material from demolished buildings. The main street in Verulamium (St. Albans) had shops that had been built using wood taken from the local fort when it was demolished in 49AD. The London we know today is a great deal larger than it was in Roman times. If you imagine an area the size of the current City of London, then that was the placement and size of Londinium. Originally the Romans established the administrative capital of Britain at Colchester. But after the Boudiccan rebellion of 60/61AD., Londinium became not only the administrative hub of Britain, but also the main trade centre for shipping to and from Europe.